The uninterrupted spiritual authority imparted by the laying on of hands. 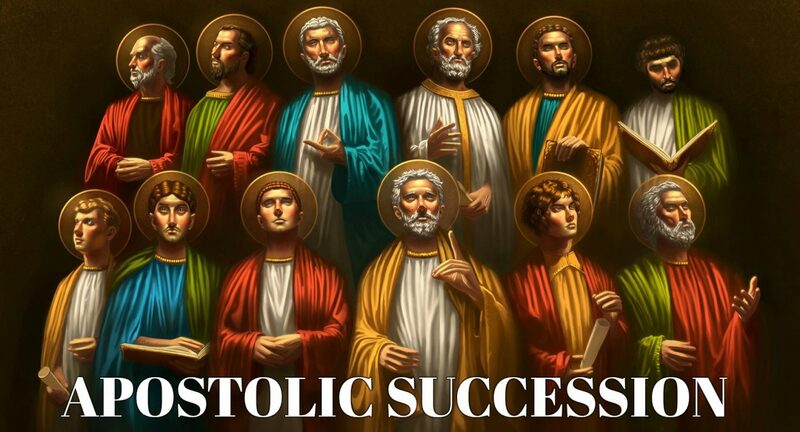 Originating from The Chiefest of the Apostles, The Lord Jesus “The Christ”, who ordained the original Apostles, and is maintained through unbroken lines of succession through successive Patriarchs, Popes, Bishops, and Clergy in the One, Holy, and Universal Church. 13 And he (JESUS) goeth up into a mountain, and calleth unto him whom he would: and they came unto him. 14 And He ordained twelve, that they should be with him, and that he might send them forth to preach, 15 And to have power to heal sicknesses, and to cast out devils: 16 And Simon he surnamed Peter; 17 And James the son of Zebedee, and John the brother of James; and he surnamed them Boanerges, which is, The sons of thunder: 18 And Andrew, and Philip, and Bartholomew, and Matthew, and Thomas, and James the son of Alphaeus, and Thaddaeus, and Simon the Canaanite, 19 And Judas Iscariot, which also betrayed him: and they went into an house. 14 Now when the apostles which were at Jerusalem heard that Samaria had received the word of God, they sent unto them Peter and John: 15 Who, when they were come down, prayed for them, that they might receive the Holy Ghost: 16 (For as yet he was fallen upon none of them: only they were baptized in the name of the Lord Jesus.) 17 Then laid they their hands on them, and they received the Holy Ghost. Is the doctrine in some of the more ancient Christian communities that the succession of bishops, in uninterrupted lines, is historically traceable back to the original twelve Apostles Within Catholic Christianity it “is one of four elements which define the true Church of Jesus Christ” and legitimizes the existing sacramental offices, as it is considered necessary for a bishop to perform legitimate or “valid” ordinations of priests, deacons, and other bishops. Apostolic succession is transmitted during episcopal consecrations (the ordination of bishops) by the laying on of hands of bishops previously consecrated within the apostolic succession. This lineage of ordination is traceable, according to the Catholic Church, to the original Twelve Apostles, thus making the Church the continuation of the early Apostolic Christian community.